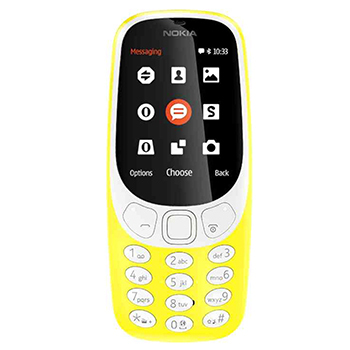 The new Nokia 3310 reimagines the the iconic silhouette of the original, with a modern custom designed user interface and colourful matte (Grey & Blue) or Glossy (Red & Yellow) finish. Beautiful push buttons and iconic, shaped design frames the 2.4” curved window with polarized layer for better readability in sunlight. At 115.6 x 51 x 12.8 mm the device fits comfortably in the hand. Remember the freedom from the endless Nokia 3310 battery? 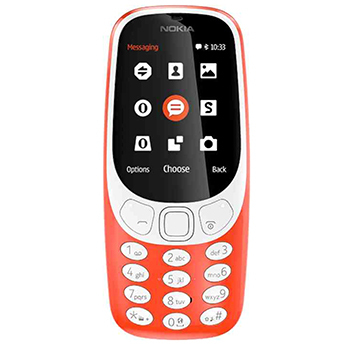 With the new Nokia 3310, you'll enjoy the same long-lasting battery experience from the removable 1200 mAh battery, so you can talk all day, or leave the phone on standby for up to a month and charge with the Micro-USB port. The 2 megapixel Camera keeps things simple, with an LED flash. With 16MB internal memory and support for up to 32 GB memory card you'll be able to store all your snaps on the go. Play the legendary 3310 Snake game. The iconic game is back with a small update that makes it even more fun to play on the colour screen. Stay connected with 3G connectivity and a lightweight platform that has a selective range of apps including a slimmed down version of the Opera web browser.